In Japanese, frogs make the ‘kero kero’ sound (ribbit ribbit essentially). So in a cute word play, one of Gero’s symbolic animal is the frog–‘gero gero!’ Our second day in Gero was mostly spent exploring the town’s various stores for local snacks–a very worthy endeavor if you’re a foodie because there are endless things to try! We woke up to clouds rolling in from the mountains and some light rain, but fear not since our ryokan had already prepared for us large umbrellas for our day of exploration. Gero on a cloudy day has a mysterious cloudy vibe to it, makes me think about Spirited Away all the more! A fascinating Pudding Jam we found as we were shopping–you’re suppose to spread it onto your bread kind of like a creamy custard spread! A bite of the Hida Beef meat bun–if only all meat buns taste phenomenal like this! Stumbling upon our old friend, Charlie Chaplin! A ‘kaeru’ shrine, which is Japanese for frog! Even after multiple snacks and unlimited samples at Gero’s many omiyage gift shops, Alex and I were still ready to have lunch after walking around all morning. 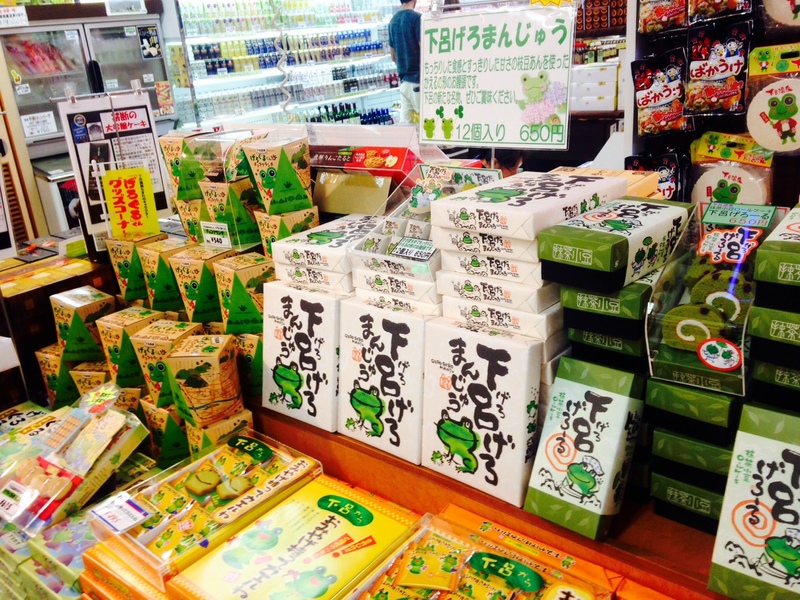 Tip #5 Check out Gero’s many omiyage stores, and don’t forget to choose one of the many cute frog-decorated ones! Buying omiyage, Japanese for gifts and sweets, is a tradition the Japanese uphold when they visit a new city–afterwards, you share with your coworkers and family the local snacks from wherever you visited. I love it, it’s a delicious custom and perfect excuse to try a bunch of snacks! Lunch was at a restaurant specialising in Unagi (freshwater eel) and Gyudon, essentially thick slices of sweetly marinated Hida Beef on a bed of rice. Both were absolutely delicious and worth every bite even though we were full half way through the meal! The unagi was tender but crispy on the bottom. With the sweet soy glaze over it, it went amazingly with the rice. I also got a serving of sashimi on the side which was also very good. Alex ordered Gifu Prefecture’s famous Hida Beef on a bed of rice–I think it’s safe to say we both agreed Hida Beef is some of the highest quality beef we’ve ever had. After lunch, we headed back to Yunoshimakan for some foot onsen and afternoon lounging since it was pouring outside by then. The pitter patter of rain, your feet soaked in hot spring waters, and a gorgeous view? I think Yunoshimakan was telling me to become a poet and write a haiku or something–it was such a lovely experience! But of course, we couldn’t finish our trip without one last dinner. In short, dinner was sukiyaki with Hida Beef, dipped in a raw egg, vegetables soaked in the sweet soy soup base, and some rice with seafood on the side. It truly was an elaborate dinner set that rendered us unmovable afterwards! Ryokans are always known for its traditional dinner sets and when it’s served in your room, there is an art form in the way all the dishes are presented. Beautiful! Stopping for lunch at a restaurant famous for its Grilled Unagi (freshwater eel) and Gyudong 牛丼–a bed of sticky rice topped with sweetly marinated slices of Hida Beef and sweet sauce, yumm! Back to the ryokan for some more onsen before the rain–the clouds were rolling in on us! A collection of seafood delicacies–not for the fainthearted as I had trouble eating some of them, the shell one was a Japanese version of escargot! More delicacies–shrimpe with ikura, grilled sardines, and some type of liver I couldn’t bring myself to try, next time when I’m feeling more lion-hearted! Ticket from Gero back to Nagoya before going back to Tokyo! The Goldfinch is my current book of choice, it’s a phenomenal read! Gero was a phenomenal hot springs experience we thoroughly enjoyed. Yunoshimakan has its own rooftop hot spring, which overlooks Gero City, so it was all the more lovely! To be honest, we had never heard of Gero, Japan until we stumbled upon it while researching for a place to go that neither of us have been to. If you’ve traversed across the major Japanese cities like Tokyo, Osaka, and Kyoto, maybe it’s time for some quaint town explorations with amazing mountain views! And in the spirit of Japanese frog sounds, ‘gero, gero’! Liver is the best! You have no idea what you’re missing out on 😉 Haven’t tried unagi…yet, but those pictures make it look far more appetizing than what I saw in Tokyo so I might just give it a try if I come across it this time around ^-^ And thanks for stopping by! Thanks for reading! Next time, I’ll have to be more adventurous! Very inspirational! I’d love to explore Japan one day. Thank you! You definitely should, it’s a haven for foodies! Too many choices indeed! I love that about Japanese shops–they have everything you want! Thanks much for posting this! I had never heard of Gero either and it looks exactly like the kind of place that hubs and I would love. Maybe you say it in part 1 but how did you find the ryokan? Thanks so much for reading! I use japanican to search up ryokans to stay at in Japan, I definitely recommend it! Gero’s a lovely place that’s a little off the beaten path, but definitely worth the visit! Thanks for the info! I’ve never used japanican so I’ll have to check it out. Hubby and I *love* “off the beaten path*. So happy for your tip! I’ll be there in Nov & am booked to stay at the same ryokan. Thanks !